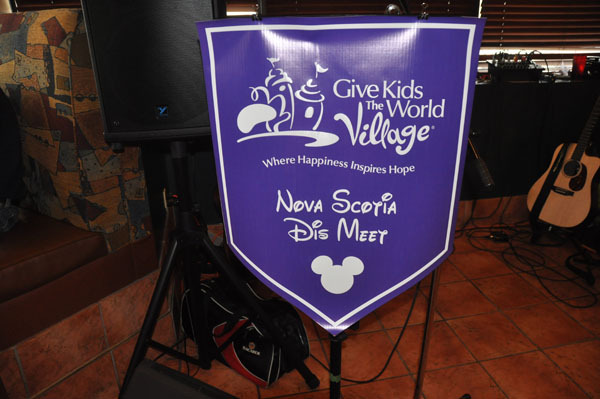 I recently returned from a very successful fundraising event for Give Kids the World (GKTW) in Lower Sackville, Nova Scotia! I can truly say I have friends around the world due to the DISboards and the DIS Unplugged Podcast. 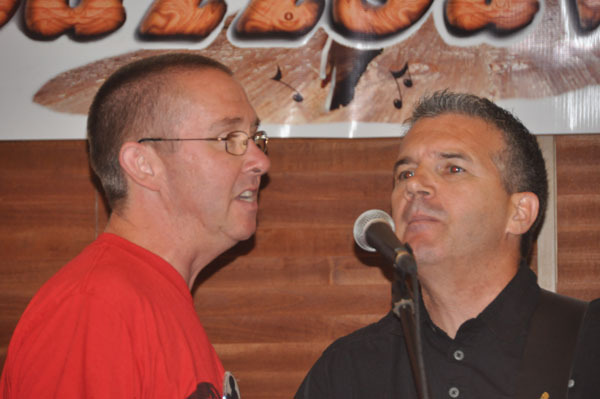 Teresa and I from the DisUnplugged podcast were invited guests at this August 11, 2012 event. Evelyn and her great team had arranged to have Angles Family Eatery and Pub for the afternoon. The restaurant was closed for several hours while they had the event. 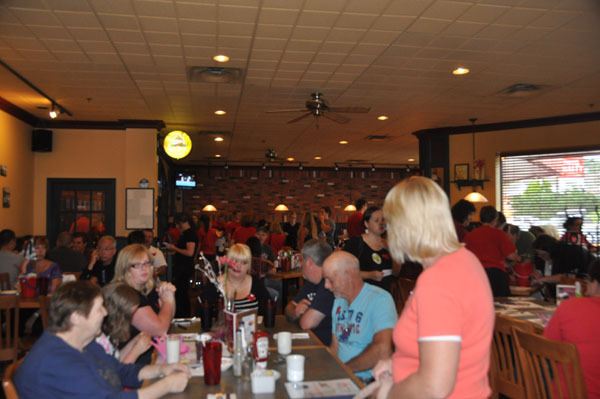 There were 142 guests in attendance; there would have been more people but we were limited by the occupancy rules for the restaurant. They sold tickets in advance to this wonderful event and your ticket included 5 penny auction ballots. They had plenty of things for the kids to do at their own separate table. 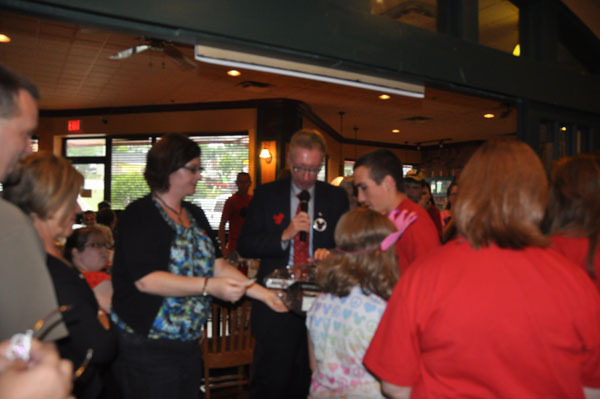 The group had also arranged over 40 door prizes so you had a good chance of winning something. Evelyn had arranged for her Uncle Louis to be the master of ceremonies for the afternoon. He kept everything moving quickly so you never got the chance to be bored. 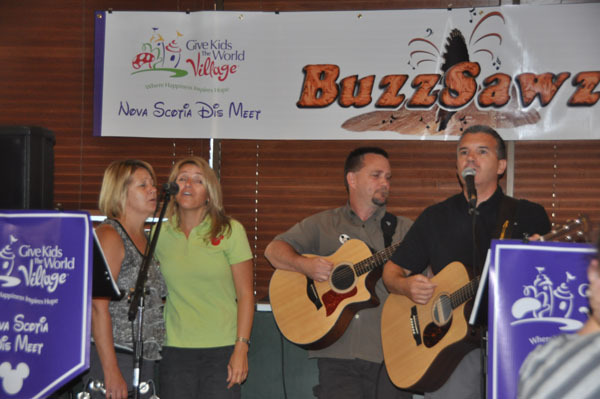 There was great entertainment by the BuzzSawz. We were all provided with song books to sing along with this great band! The afternoon moved by too quickly. 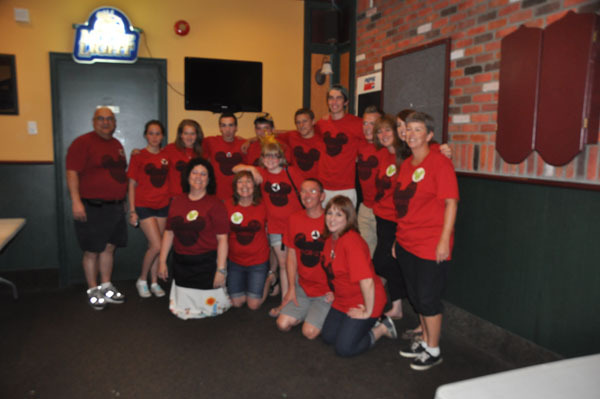 It was hard to believe that my love of Disney had brought me to Nova Scotia and 142 new friends. 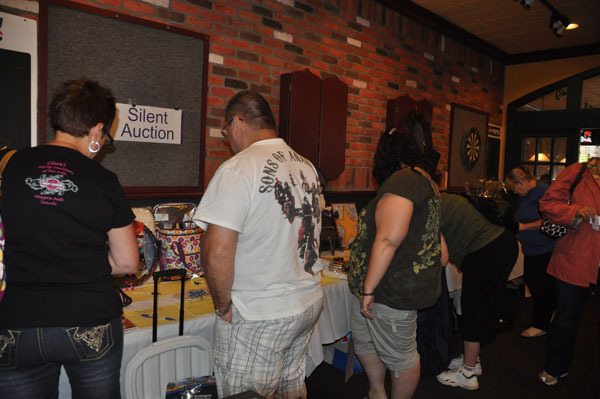 There was a separate room for the Penny auction and Silent Auction items. I also want to mention that everything, and I mean everything, was donated to this very worthy cause. They had no expenses and all the money raised went to the Power of 10 campaign for Give Kids the World. Mike and Syl performed for the first time the song they wrote about Give Kids the World. It had many of us in tears and we gave them a standing ovation when they were done. If you enjoyed the song you can make a donation here. Every dollar raised helps these families that travel to GKTW for a wonderful experience. The planning committee had an excellent setup when you entered to get your tickets and then at the end when it was time to pay for your winning item from the silent auction. They had a board listing all the winners and you just got in line to pay. The line moved quickly and before you knew it you were walking away with your item. 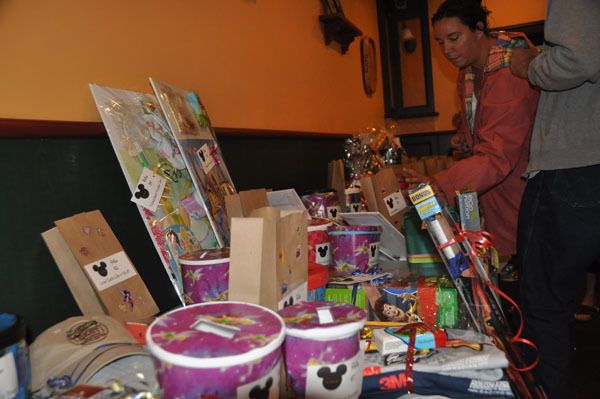 They also had a great system when it came time to pull the winning ballot from each of the donated penny auction items. It moved so quickly and everyone was quick to jump up and claim their prize. From start to finish this group looked like they had been organizing events like this for years. Many of the people on the planning committee met each other when they volunteered for this event in January. Before that they had all been on the DIS boards but didn’t know each other, we got to see that they are good friends now. I can’t forget to mention a funny moment that happened when I arrived in Nova Scotia. When coming through customs at the airport, I was sent to see an immigration agent. She felt she couldn’t make a determination about me quickly enough so I was sent to another agent for further questioning. I was nervous when I saw this agent come out with a bullet proof vest on. She asked what I was in Canada for and I answered I was there for an event. She asked for the person’s name I was visiting and she got a smile on her face. She then asked if I was there for the Give Kids the World event. It turned out she was going to the same event! I heard the song, “it’s a small world” playing in my head. What were the chances of this totally random event? I did get a chance to talk with her at the fundraiser. She was the photographer at the event. The afternoon flew by too quickly. At the end of the day this group had raised over $5600.00 for Give Kids the World and the total is still growing daily. Teresa and I had a wonderful time in Nova Scotia. Our hosts were wonderful and we were made to feel like part of the family at this event. Congratulations to Evelyn and her team for a job well done!